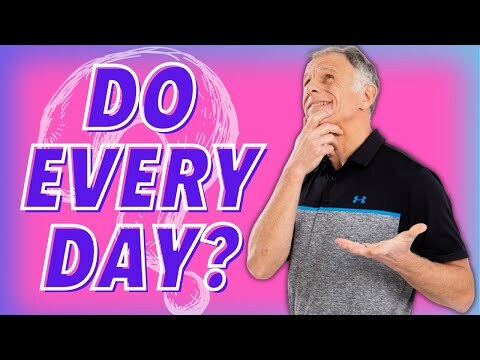 I love these exercises from my favorite YouTube physical therapists, Bob and Brad, because I can do many of them while sitting at my desk, they don’t require any special equipment, and I don’t get all sweaty in the middle of the day. Personally, I’m trying to do the exercises several times a day, because I spend a lot of time sitting at my computer. My neck, shoulders, hips and knees need help! Poor posture contributes to spine, joint and breathing problems, and it sets you up for chronic pain as you age. Hunching, or forward head posture, strains your neck, shoulders and upper back. Think about it—if you consider your head weighs about as much as a bowling ball, that’s a lot of extra stress on the muscles supporting your neck and spine. Neck and shoulder strain can cause headaches, dizziness, and jaw pain. It can also make you more vulnerable to neck and shoulder injuries. Poor posture prevents you from taking deep, healthful breaths. And when your body does not get enough oxygen, fatigue is a common complaint. Sitting too much—especially slouching—not only exacerbates forward head posture, but causes hip and lower back problems. The muscles in the lower back and hip girdle help us stand, walk and stay balanced. When they are weak or overly tight, our bodies not only become painful, but unstable. Our bones, muscles and joints really are connected. When one part of our skeleton or spine is weak, another is affected. We have to understand the importance of good posture and take steps to correct or maintain it. If we don’t take care of our neck, shoulders, back, hips and knees as we age, we are more likely to be injured, fall or suffer chronic pain.